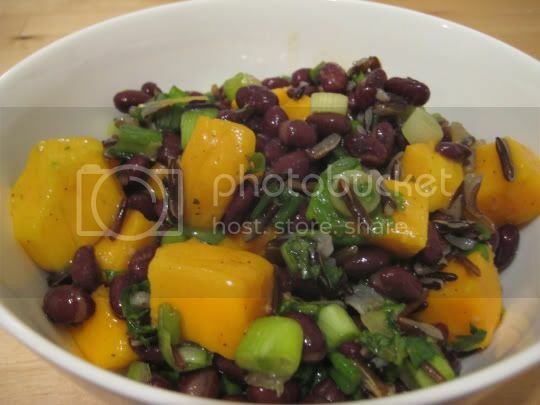 Filling and tasty, this tropical salad is great as a side or main dish for those hot summer days, where black beans and wild rice combine for a healthy, protein- and fiber-rich meal. Crunchy green onions and ripe, juicy mangoes add a nice texture and flavor, with the sweetness of the mango contrasting nicely with the tangy lime-based dressing. The dressing - lime juice, salt and pepper, olive oil, cilantro, and tomatillo salsa - definitely add a kick to the dish (read: spicy). In fact, it may be too much of a kick...depending on the brand of salsa you use, you may want to cut back on the pepper. Also, the tanginess of the lime juice (which is enough for the recipe) really makes a whole teaspoon of salt unnecessary. It was a little too salty at first bite, but this seemed to mellow the next day. Ironically, the salad is definitely best eaten the same day. The aciditity of the lime juice does something to the mango chunks after a while, making them soft and a little mushy. Still worthy of eating leftovers, but not after more than a day. Make again? Yes, with less salt and pepper.